Raise taxes on the rich? This meme has been making the rounds, in various forms, online. It’s almost credible. Yes, taxes were so high in the ’50s and ’60s that many reasonable people thought them to be confiscatory. Yes, America built the interstate highway system — but used eminent domain to do so. Would you be crowing about this accomplishment if it was your farm that became a freeway? If it was your neighborhood that became an afterthought to an on-ramp? If it was your ancestral home for which you were paid pennies on the dollar by an all-powerful government? Yes, we built the internet. The original intent was to link the military with certain universities, to keep a multiply-redundant and macho form of civilization going in the event of thermonuclear war. That was DARPA. A lower taxed society actually developed the internet as we know it. For all intents and purposes, the internet came about in 1993, with the invention of the first graphical web browser. We’re just lucky we never needed to use the DARPA version. Yes, we sent men to the Moon. That was another military mission. A military that had more money than it knew what to do with. We did it because it was our way of poking the USSR in the eye: “Ha! You sent Yuri Gagarin up into the stratosphere, but we sent men to the Moon!” Remember, the Moon voyages stopped because average Americans saw no utility in them. The military had all its spy satellites deployed by then anyway, so they let it drop. No, we did not defeat Communism. Communism was an unsustainable economic system that was self-defeating. We did not defeat authoritarianism, which is rising again in Russia, Ukraine, Romania, Bulgaria, Hungary, Poland and Kosovo. It was the authoritarianism that we wanted to defeat. Nobody would have had a problem with the Soviet Union if the people freely and regularly chose socialism in fair elections. Our education system has never been the envy of the world. This is a myth. Our universities have been, and still are, justifiably the envy of the world: people from all over the planet want to attend Harvard, Yale, Stanford, and the like. Taxes don’t support them and never did. But tell me a time when rich princes and princesses were sent to the United States to attend its fabulous tax-supported elementary schools? Our middle class has never been thriving. In fact, the middle class can pretty much be defined as “those people who feel caught between the upper class and the lower class, and who constantly feel as if the floor is rising but the ceiling is not.” In his book, The Big Change, Frederick Lewis Allen described the early 20th Century as being a time of a rapidly growing divide between the very rich and the rest of society. The consolidation of corporate capitalism in the 1920s brought about a further concentration of wealth. Allen explained how the middle class was disappearing by the 1940s because of the difficulty in creating new businesses: all the corporations had already cornered the market in just about everything. There just wasn’t a chance for Joe and Jane Average any more. If that sounds unlikely, or possibly familiar, don’t be surprised: somebody has been saying virtually the same thing in every election since the dawn of the industrial age. Every statistic you can find to prove the shrinkage of the middle class can be countered by equally verifiable statistics that prove the opposite. Our economy was unparalleled. Yes, it was. Back in the days of American imperialism. We wanted colonies, so we started a war with Spain and took Cuba, Puerto Rico, Guam, and the Philippines. After we established our international credentials in the first World War, our trade increased phenomenally with a broken Europe. They couldn’t manufacture anything, but they could buy things with money that we lent them. Then the second World War came around, and we established an empire the likes of which the world had never seen. The dollar was, and is, the world’s currency. When the world’s commodity markets are priced in dollars, it is a tremendous advantage for the United States. When you have an empire, and not only the empire but its enemies have to deal in your currency, you can have an unparalleled advantage in the economies of the world. Yes, taxes supported that empire. Do we really want confiscatory taxes again? It will go, once again, to the military and to the maintenance of empire. Oh, and one last thing. The only people who ever really paid the confiscatory taxes were the people who considered themselves middle class. The rich quickly found ways to exploit deductions, so that while the nominal high rate was 90%, absolutely nobody paid anything close to that amount in taxes. 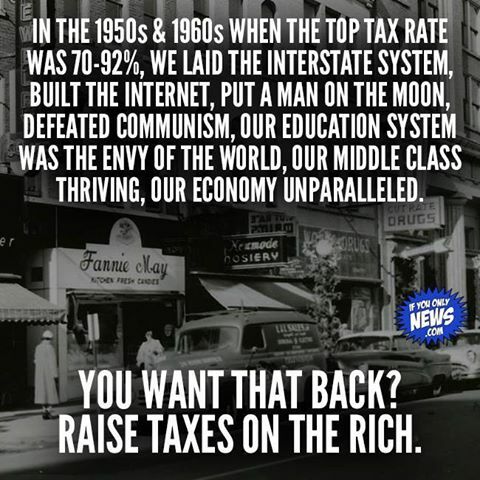 We don’t need to raise taxes on the rich. We need to get rid of the American military mindset first. Otherwise that uniformed leech will syphon off the nation’s wealth, just as they did in the vaunted ’50s and ’60s. Or don’t you recall VietNam? Emmett on Why Sanders Is Nonsense. Big Burly on Why Sanders Is Nonsense. Emmett J. Hoops on Apple? I’d rather chew gum.